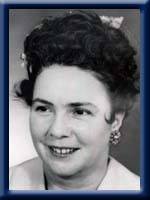 Hannaford, Violet Rosalea, 94, of Mill Village, passed away on Tuesday, October 2nd, 2012, in North Queens Nursing Home, Caledonia. Born in Mill Village she was a daughter of the late James and Ada (Olmsteed) Clattenburg. She worked for many years for Suttle & Seawinds. Violet was well known for her lovely quilt making, baking and cooking abilities. She also enjoyed fishing, camping, making ceramics, gardening, farming and blue grass music, and she attended many festivals over the years. Violet served as Church Organist for All Saint’s Anglican Church, Mill Village, for over 20 years. She is survived by a son Carleton (Margaret) Manthorne; daughter Helen (Robert) Vaughan, both of Mill Village; seventeen grandchildren; many great grandchildren; sister Dorothy Parnell, of Mill Village. She was predeceased by husbands Clarence Manthorne, Arthur Hannaford; son Gerald; daughters Deloris, Kathleen; brothers Kelly, Clarence; sisters Zelma, Aurelia, Helen, Florence, Sadie and Madge. 0ur deepest sympathy to you Carleton & Helen and family in the passing of your mom Voilet. I have fond memories of her. Always keep all of your great memories of her in your hearts. Our deepest sympathy and Prayers at this time to the Family . know we will be thinking of you………………. Carleton and Family. We are so sorry to hear of your Mother’s passing. You were there for your Mother always. You and Margie took her into your home, when she didn’t have a home and took wonderful care of her. Thinking of you all xo. I’m so sorry for loss. You are in my thoughts. Sending our sincere condolences to the family at this difficult time. Our heartfelt condolences to the family of Violet. Our thoughts are with you in this time of grief. much better place. God Bless you all at this difficult time. TO CHARLETON,HELEN & FAMILIES;OUR THOUGHTS AND PRAYERS ARE WITH YOU AT THIS SAD TIME. On behalf of my mother, Norien, and my brothers & sister, we wish to express our sympathy on the passing of your Mother. May you find comfort in your memories of her. Our thoughts and prayers are with you both. So very sorry to hear about your Grandmother. As I agreed with you this am she lived a full life and now she is at peace. Just think all the changes in history that she lived to see. God Bless you all. We were so sorry to hear of Violet’s passing. We are thinking of you all and send our love……Violet was a lovely person and it was always great to have a chat with her……. Helen and Carleton: I am sorry you have lost your mother. Although I did not know her well personally, I remember seeing her at various functions in the community. Pleae except our sincere condolences for your loss. She was a wonderful lady and will be missed. Sincerely Sherri & Denny H.